It’s been a while since I’ve done one of these, but I’ve seen some covers recently that I absolutely love and want to share/talk about. 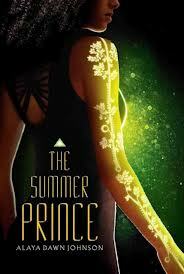 This first belongs to an author seriously blessed by the cover gods. 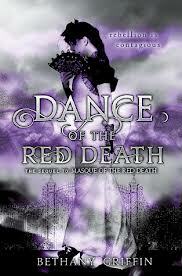 Masque of the Red Death was stunning and eerie and dark and lovely, and its sequel, Dance of the Red Death, due out 23 April 2013 is utterly gorgeous. It takes us in a different direction than the first, shifting the color scheme to the opposite spectrum. Where the first was reds and blacks, this is purples and whites, BUT- keep in mind that in most European societies, from Renaissance straight through Victorian (from which time this borrows much of its atmosphere) lavender and white were second stage mourning colors. After the death of someone close to you, you were expected to wear black for six months, then you could expand to white, lavender, and grey for another six months. Araby Worth has made some progress in her crippling grief, but she’s still in mourning, and this cover shows that. The clothing is a little less formal, more flattering and less dramatic, and her posture is different. Rather than turning completely away from us, she’s more or less in profile, only her face still angled away and shielded by the fan, in itself less obscuring than the parasol from the first. Just as the colors are expanding from the deepest stage of grief, so her posture is also opening up, not just to us as the audience but also to the people in her life. She’s got progress yet to make, but this cover definitely shows how far she’s come. 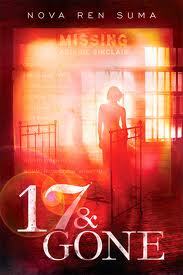 17 & Gone, by Nova Ren Suma, is due out 21 March 2013, and I’ve loved this cover since it wsa revealed. It’s coloration is unique in YA, soft oranges and yellow, like the glow of candles, but there’s also a very CSI: Miami vibe to it. The bed frame- no mattress, did you notice?- is ominous, like an episode of Criminal Minds, and the windows beyond the girl’s silhouette don’t belong to a high-rate hotel. My favorite part, though, is how, if you look very carefully, you can see the details of the missing report underlaid in the image. Without those details, it might just be a particularly sentimental trip down memory lane, a runaway reflecting on the world she left behind, but those words, subtle but distinct, render it into something much more terrifying. We don’t know if the girl in the picture is the girl of the missing report, we don’t know if she’s simply missing by her own volition or someone else’s will, and we don’t know if something far worse has happened to her. This cover does an amazing job of capturing attention, which is exactly what a cover should always aim to do. 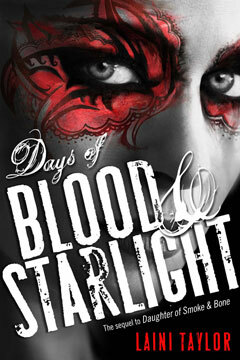 Another sequel with a cover as stunning as its first one, Laini Taylor’s Days of Blood and Starlight, due out 6 November 2012, has the same drama as The Daughter of Smoke and Bone. The mask is gone, the question of pure identity no longer a mystery, but the glamour and the beauty are still firmly in place. Rather than the blue representing Karou, we have red- Akiva’s flaming wings, anyone? And, of course, the titular blood. The contrasts are sharp- except for the red, the rest of the image is black and white, the focus just slightly blurred or hidden behind the title. Though the patterns around her eyes are delicate and lovely, it’s difficult to escape the visceral memory of war paint. This is going to be a book with a lot of violence and blood in it, but just as with the first, there’s also a great deal of unexpected beauty, probably hand in hand with the ugliness. 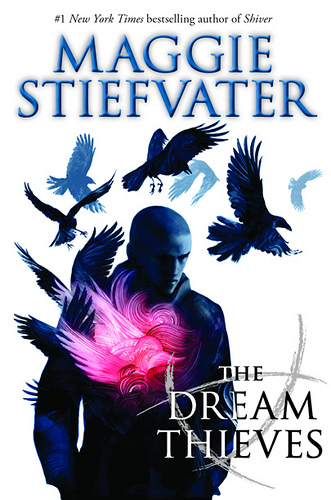 Oh, this one made me so happy when the cover was revealed. 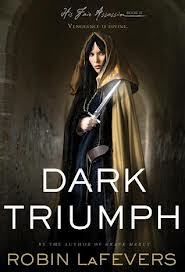 Dark Triumph by Robin LaFevers, due out 2 April 2013, is the sequel to Grave Mercy, but it’s not Ismae’s story this time. 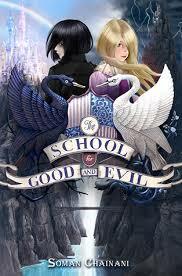 This time, we see Sybella, with a very different kind of history and outlook than her half-sister. Here we get much more somber colors than the first, darker colors. This isn’t someone who works out in the open to be seen, this is someone who prefers to work in the shadows to conceal dark deeds. Her face is sharper, her expression more forbidding, and the way the light gleams on the blade immediately brings the eye to the very real threat of that knife- and the realization that she won’t hesitate to use it. 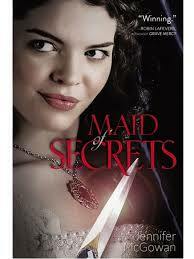 Combined with the expression on her face, you get the feeling she uses it maybe more than she’s supposed to. Where Ismae was out in the open air, Sybella is in a tunnel- confined, claustrophobic, something that can far more quickly become a trap than an escape. 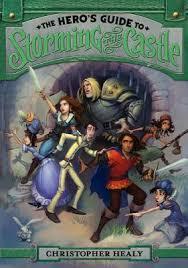 Sybella’s story promises to be dark and painful but- look at the soft, dull gold of the cloak. Maybe it’s not without redemption. And oh, I can’t wait. 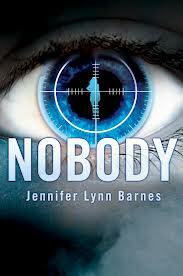 Last one for this month is Nobody by Jennifer Lynn Barnes, out 22 January 2012. At first glance, this cover is striking but a little hard to figure- you’d have to look at the description to know whether it’s supposed to portray assassins, snipers, or spies. But, you don’t really have to know. The contrast around the eye, dragging all the focus to the brilliant blues within the iris, gives you the same narrow view as someone looking through a scope. All that matters is what you’re aiming for. The thing is, you don’t know if you should be intrigued because what’s wanted is information, or if you should be very afraid that the girl in the crosshairs is going to end up dead. Perhaps my favorite detail is actually below the eye- where the skin shifts into a curling smoke or fog, giving the impression that the person you’re looking at? Might really be nobody. Any covers you’ve seen recently that really caught your eye? Share below!